WEDEW is a versatile, self-contained, sustainable energy-water generator. The machine converts biomass into essential human resources while sequestering would-be greenhouse gases into the ground. WEDEW helps communities plan for and respond to global climate change by providing reliable energy and water, which works no matter how volatile the environment becomes. 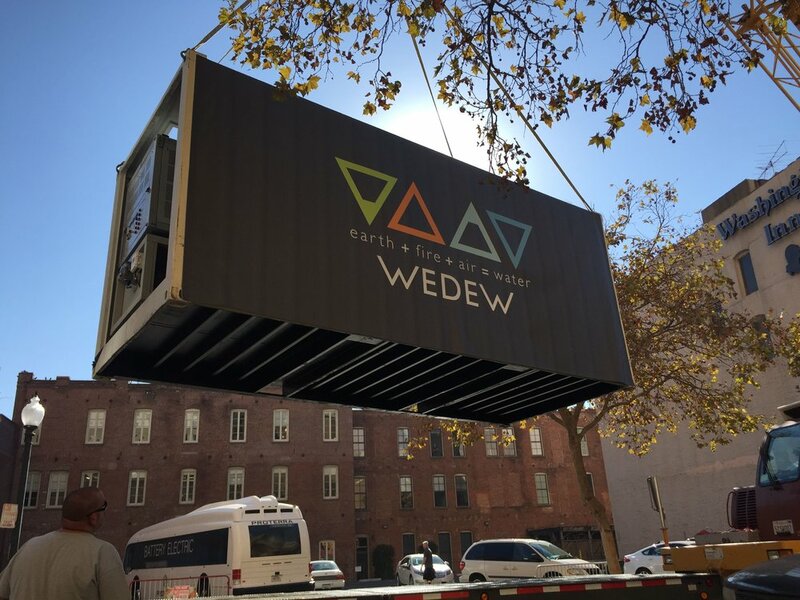 WEDEW is a point-of-use system, meaning vulnerable communities are no longer beholden to infrastructure for their water and power. 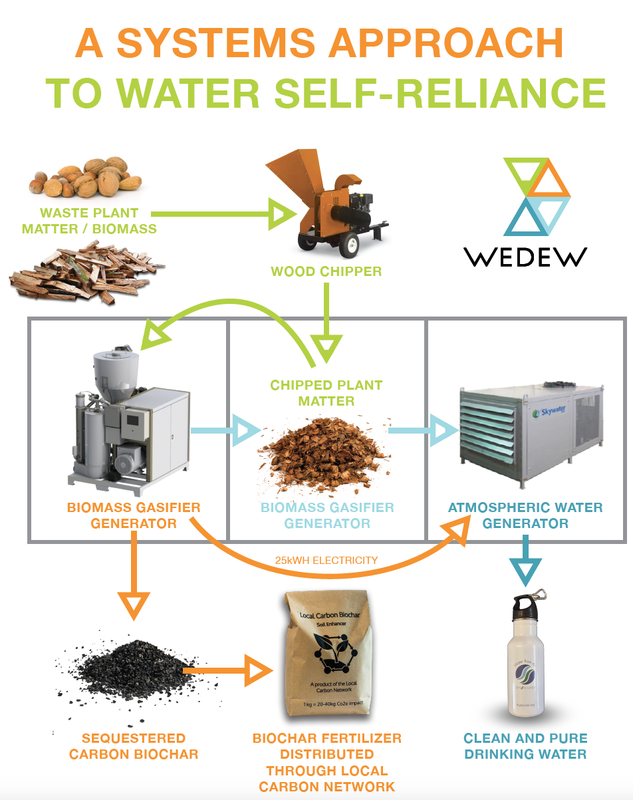 The sustainable exchange of biomass for water around WEDEW can become the cornerstone of local economies. WEDEW contains everything needed for aid work in a secure, transportable container. It can provide on-demand water and power during emergency events in addition to refrigeration, cooling, and communication. LESS THAN 1% OF WATER ON THE PLANET IS FRESH. MORE FRESH WATER EXISTS IN THE ATMOSPHERE THAN ALL THE RIVERS ON EARTH, YET WE HAVEN’T TAPPED INTO THIS VAST SUPPLY. Biomass gasification is not ordinary combustion: the process superheats green feedstocks and converts them into electricity, hot humid air and biochar. WEDEW runs on biomass gasification, which operates at less than 1/10th the cost of solar PV while occupying the area of a single panel. Biomass fuel is available in many parts of the world for little or no cost as the byproducts of agriculture, forestry, and natural disasters. Biomass gasification has competitive advantages when compared to alternative sources of power for atmospheric generation, possessing the convenient benefits of diesel gensets without the harmful effects. WEDEW landed at Verge18 in the San Francisco Bay Area, where it made water and charged the conference’s microgrid.